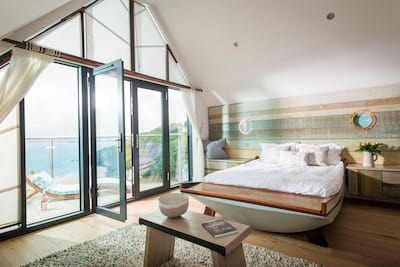 Immerse yourself in the luxury living of Moonjar, a chic and stylish split level town house overlooking the blue bay of St Ives. This newly built prestigious holiday home offers 3 beautiful bedrooms each with jackpot panoramic sea views and a cool coastal theme. Contemporary bathrooms complement the luxury ambience. Reverse level in layout, Moonjar presents high life living from the penthouse top floor with large open plan living, kitchen and dining space opening onto the balcony. Private gated parking for up to 2 cars. 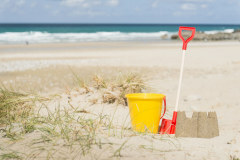 A perfect holiday home for friends and family alike amdist the cosmopolitan seaside town of St Ives, West Cornwall. 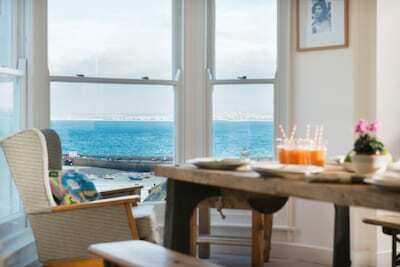 Located high above Porthminster Beach and the beautiful St Ives Bay, Moonjar is set to impress. Arrive to the central hallway with staircase leading to the lofty penthouse level and open plan living, dining and kitchen spaces. 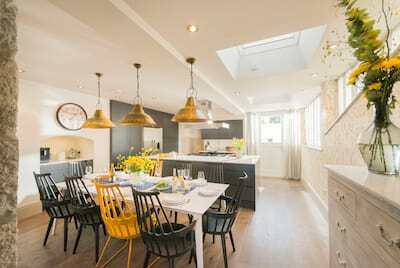 This light filled welcoming room brings friends and family together in comfort and coastal style as you relax against the uninterupted seascape backdrop. The smart modern kitchen has been kitted out with all you could need for holiday cooking, with every cup, plate and bowl thoughtfully considered to evoke the coastal location. The open plan layout ensures conversation flows as you enjoy a pre-dinner drink whilst you map out the menu. 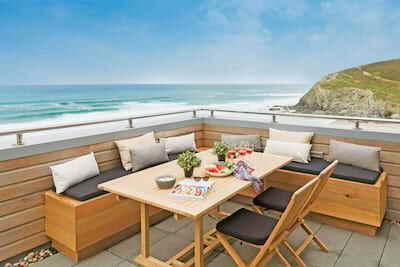 The Conran designed oak dining table comfortably seats up to 6-8 guests, pull back the tri-fold doors and enjoy the al fresco experience in true Cornish style. Sink into soft sofas at the end of the day or cosy up in the winter months for an afternoon of stormwatching with a good book. The bedrooms are set over the first and ground floors and have been lavished furnished with the highest standard of 5 star beds and mattresses. The indulgent master bedroom offers super king bed with stylish ensuite bathroom, awake to the sound of the sea. The second bedroom is also on the ground floor with adjacent cloakroom. The ground floor homes the family bathroom with deep bath and ample space for the perfect post beach pamper, bedroom three and hidden away snug, the perfect escape from the hubbub of the penthouse level above. The personal touches and considered finish oozes style and charm from the nautical stripe and cool coastal hues to the surfside artwork and beach scenes that adorn the walls. 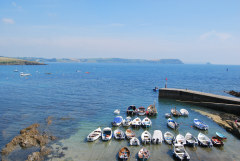 Moonjar is no ordinary holiday home but a wonderful family base from which to explore West Cornwall. From the living space, tri-fold doors gracefully slide open to reveal the Cornish elements of salty sea and coastal hubbub. Once fully opened, guests can enjoy the luxury of the inside out ambience as you dine. A small slate courtyard seating area is access from the ground floor bedroom and snug room, recline in the wooden steamer chairs and watch the boats go by. 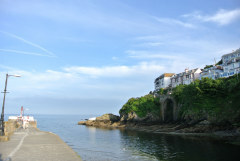 With its plum location, wander down into the heart of St Ives in under 15 minutes and enjoy the white sands of award winning Porthminster Beach and the very unique Porthminster Beach cafe. 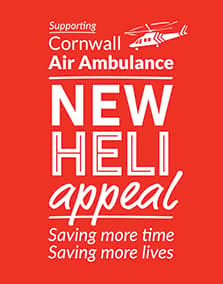 The harbour is alive with activity from dawn until dusk and really is one of the most beautiful iconic Cornish harbours in Cornwall. 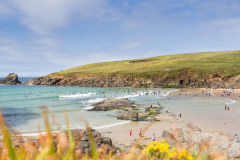 Discover the hidden away streets and charming curio shops, the plethora of galleries and artisan potteries, chic cafes and take aways with a twist - St Ives cleverly combines the traditional nuances with a cosmopolitan twist. 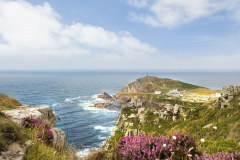 Take a day trip into the myth and legend of West Cornwall or head to the South coast with its maritime vibe and picture perfect coves. 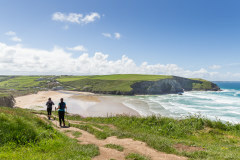 Moonjar offers superb access to the South West coastal path leading along some of the best coastal walks in the county. 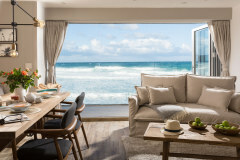 Check into penthouse luxury at Moonjar and enjoy exploring St Ives in style. Brilliant property with high end kitchen equipment, furniture and facilities. The house was lovely and very well furnished. The beds were so comfy! 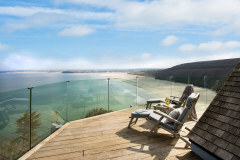 Third Cornish gems holiday in a row and the best one yet - this property is a stunner!